PICO IYER is the poet laureate of wanderlust. His perennial subject is the strange confluences and poignant idiosyncrasies born of our world's dissolving borders, and he explores it with a rich mix of astonishing erudition and wide-eyed wonder. Born in England to Indian parents, Iyer lives in Japan and California and spends much of his life in airplanes--he's very much the definition of a cosmopolitan. Nevertheless, his books don't lord his vast experience and worldliness over the reader, nor does he play the authenticity games common to writers addressing multiculturalism. He's never jaded, and his prose fairly glows with wry exuberance and fresh delight. Although he's also written fiction, Iyer is best known for his travelogues, especially the remarkable Video Night in Katmandu and Falling off the Map. His prose makes one want to leap on the next plane out of the country, but Iyer is far more than a tour guide: he's a mandarin philosopher illuminating a shifting, melting world. 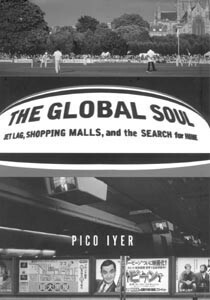 Nowhere is that more evident than in his latest collection of essays, The Global Soul: Jet Lag, Shopping Malls, and the Search for Home (Knopf; $25). A kaleidoscopic look at the global village created by immigration, high-tech communications. and international hypercapitalism, Iyer's book examines questions of identity and community in a world of constant flux, burrowing into the nuances of multiculturalism. There's a meditation on Los Angeles International Airport--Iyer makes us see that airports in general are "the spiritual center of the double life: you get on as one person and get off as another." Another essay takes us to luxury apartments located in Hong Kong shopping malls, which cater to busy executives who treat home as a kind of extended hotel stay. He celebrates Toronto--the most multicultural city in the world--even as he slyly eviscerates Atlanta in a fascinating piece on the Olympics (fascinating even for a reader whose feelings toward sports range from indifference to loathing). Surprisingly, in Japan--a country that many see as the world's foremost example of globalization's surreally homogenizing effects--Iyer sees a kind of truce between the urban anonymity of worldwide capitalism and the importance of private life. To him, Japan is comfortable celebrating surfaces and rapidly appropriating international influences because it has a secure sense of itself. The book is permeated by this sense of the importance of an internal stability that doesn't require stasis. A chapter centered around Iyer's friend Richard, a Hong Kong-based "flexecutive" who lives much of his life on airplanes, regularly circles the globe in a matter of days, and conducts his business in the ether of phone, fax, and e-mail, is enough to make even the most compulsive traveler dizzy. Yet Iyer calls Richard "one of the most human people I know, loyal and affectionate and strong enough to root himself in something other than the circumstances of his life." While The Global Soul isn't even remotely didactic, one comes away from it seeing such strength as crucial. That's never more true that when Iyer is writing of global lost souls. "[T]he unhappiest people I know these days are often the ones in motion, encouraged to search for a utopia outside themselves, as if the expulsion from Eden had been Eden's fault. Globalism made the world the playground of those with no one to play with." Iyer's opening and concluding essays imply his ethic of rooted rootlessness. He begins with a story about his parents' house burning down, relieving him of all his works in progress and mementos, and ends at his new, "alien home," in Japan, where he finds peace in living an almost monastic life in a culture that will never really embrace him. In The Global Soul, jet lag is both a metaphor for the disorientation of our centrifugal lives and the physical symptom of them. And while jet lag can be debilitating, most frequent travelers know that it can also be a weird kind of high. "[I] find myself revved up, speedy, all adrenaline as I touch down, with my mind turned off and my defenses flung open," Iyer writes. Few of us could live in such a state for long, but we're lucky that Iyer can. His openness and vertiginous insights make the whole world seem both exotic and familiar, and can even help us get our bearings on a planet that sometimes seems to spin so fast that we're about to fall off. From the March 16-22, 2000, 1999 issue of the Sonoma County Independent.